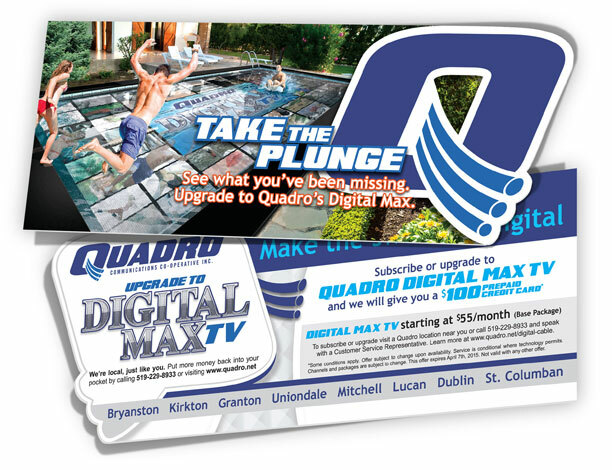 This large post card sized mailer started with a very simple concept: a bunch of people jumping into a television screen that’s also a pool. Okay, the concept seems relatively straight forward enough, but how was I to pull this off within a very strict budget and deadline? I tried several stock photo web site databases, but “a bunch of people jumping into a television screen that’s also a pool” simply wasn’t an option to purchase. No real surprise there. So I started from where I typically do…from scratch. This group of nine stock pictures created the basis for the final graphic. 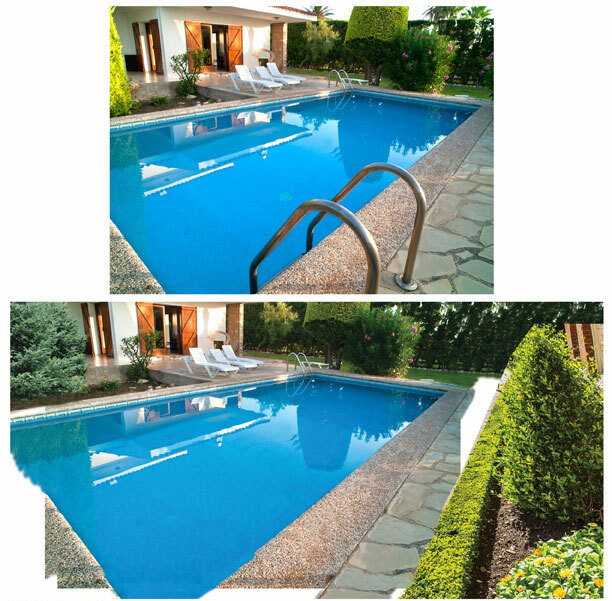 Not all of these were selected at this stage of development, but with the majority of them sorted out, the next step was to prepare the pool. 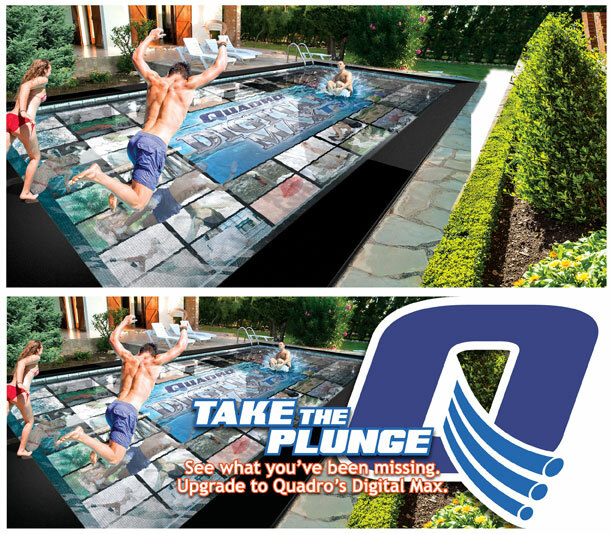 The pool edge needed to look like a television screen. The problem I encountered was, modern television frames are very thin and mostly black. In fact, many television frames are near non-existent. 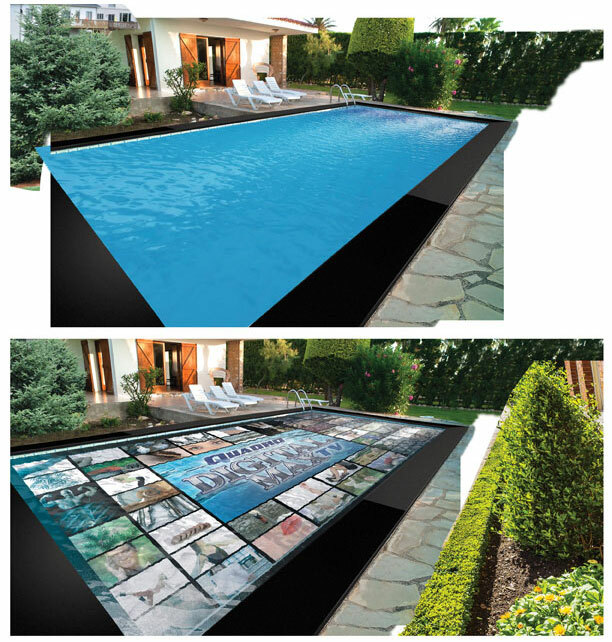 For the purpose of selling this concept, my television frame had to be thick; however this just made the pool look like a picture frame. I quickly discovered that having water in the pool was going to be a problem if I was to convince viewers that it was indeed a tv screen. Okay, no problem, I thought. I’ll just put imagery on the screen and that will be that. Only, that wasn’t that. Now it no longer looked like a pool. The single image on the screen only made it look more like a framed photograph. To address this, I created two options for the client to approve; one with a menu guide featuring fake television programs, and the other with multiple screens. The client preferred the multi-screen option. Finally, I decided to “sink” the screen image to a few inches below the water’s surface. This seemed like a good balance between tv and pool. I was then ready for the big task: sourcing the jumpers. 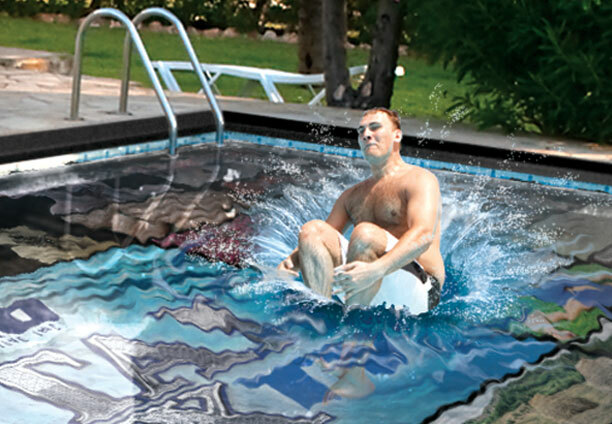 Selecting appropriate pictures of people jumping into a pool is time consuming, but not all that difficult. However for this project, it was. I needed to have specific angles to match the background imagery. What I mean is, finding a photo of someone performing a classic cannonball is easy, but finding one with the person facing the camera…and in focus…and without motion blurring…and just entering the surface…well, this is an entirely more complex search than expected. For some reason, I also found it slightly more troublesome to find good quality images of people jumping from behind. Strange. Stock photographers – get on this. This is the stage of details, details, and more details in the form of: cast shadows, water highlights, reflected light bouncing back on the body’s of the jumpers, softened edges to create depth, textures, adjustments to tones and colour matching. Details. Details. Details. On goes the headline and sub-header, as well as the company’s icon…and the front imagery is done.